I have lived in Curacao for over 10 years and I followed the weather in Curacao daily. You have to when you are into water sports, but also just to know when you have to water the plants in your garden. Most people think it is always the same weather in Curacao (sunny, good breeze and little rainfall) and that it doesn’t have the seasons you are used to at home. Well, they are mostly right, the weather is often really great in Curacao, but we actually do have some big differences throughout the year. 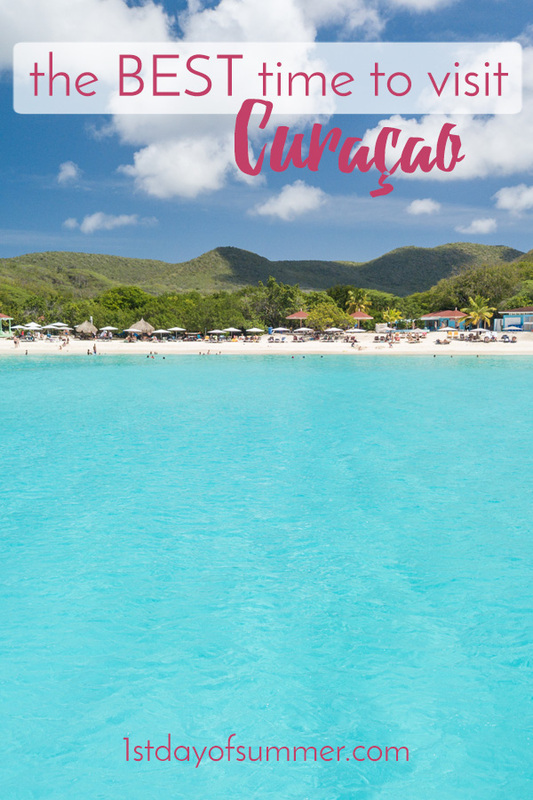 What is the best time to visit Curacao? Looking at the weather, the months of February and March are by far the best in Curacao. The temperate is great, the hillsides are green as the rainy season ended, and there are perfect conditions for water sports. 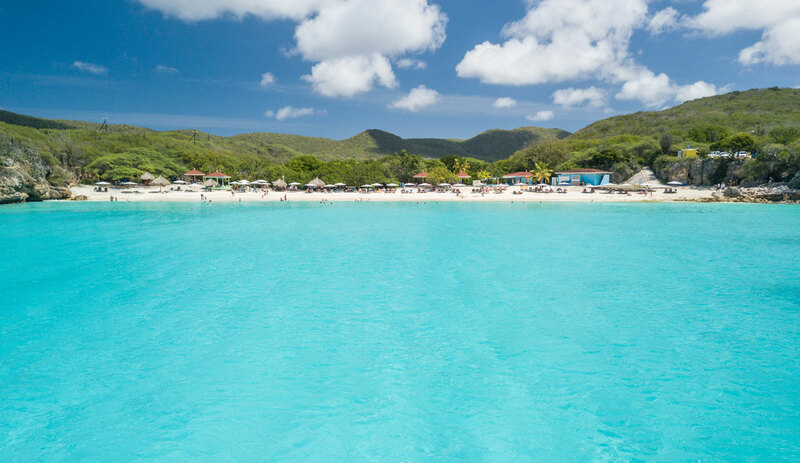 However, you can visit Curacao year round without any real problems. If you stay a minimum of two weeks you will always have some great weather during your vacation. You have to get really unlucky to have bad weather in Curacao more than 7 days in a row. Just be wary of visiting in October, which can have the longest periods of bad weather. Curacao does not know fall or spring but you can divide it up into 3 seasons: rainy (green) season, windy season (Quaresma) and summer. The one season might be better than the other but it doesn’t mean you shouldn’t visit in those less favourable times in the year. There are many advantages to visiting a little ‘out of season’. For starters, you might get really good deals on accommodations. Also, the crowds will be smaller which means you can really enjoy the beaches of Curacao without somebody sitting within 3 feet of you. It does not rain a lot in Curacao and long periods of drought are not uncommon. However, in this season, it can rain quite a bit. Most times, it rains at night and in the morning, and you see the weather clear up in the afternoon. It does not happen often that it rains all day. Curacao’s rainfall is in short, hefty bursts, with a lot of water coming down in a short time and it can be extremely local. It can rain where you are, but be dry 1 mile down the road. It seems to rain a lot less when the Caribbean has the warm phase El Niño (weather phenomenon which brings warm ocean water) but that only occurs every few years. 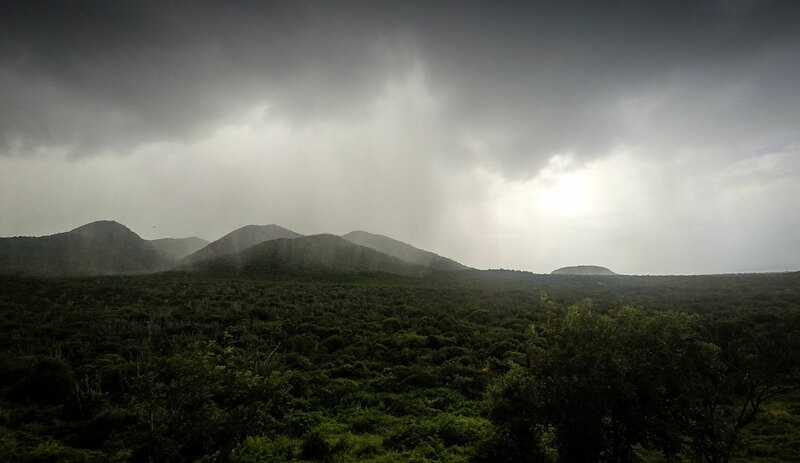 Generally, the west side of Curacao gets more rain and that area is called the Green Belt. Rainclouds often need land and mountains to form so even on a small island like Curacao that is of influence. Nice to know: traffic will slow down a lot when it rains. Visibility goes down considerably but more importantly the roads often get extremely slippery. Because Curacao can be hot and dry, the roads are covered with rubber and oil. The moment water drops on the road, it gets dangerous. I have spun 360’s with my car multiple times. Then, there are the mosquitos. Rain puddles form, which are the breeding spots for mosquitos. The day after a good rainfall, bring out the insect repellent and keep spraying. You don’t want to get dengue. Photography tip: go out after the rain stops as the rainbows can be beautiful. Rain fell, plants and trees grew and Curacao suddenly turned into a green paradise. Curacao can be very dry, but in this season the flowers bloom and you can even see grass on the side of the roads. The biggest change, however, is the wind starting to show up. Curacao is known for its almost year-long ocean breezes but now the wind will start blowing with some more force (Beaufort 4-7). Be sure to hold on to your wine glass, put a little rock on your napkins when eating and buy candles with good cover. 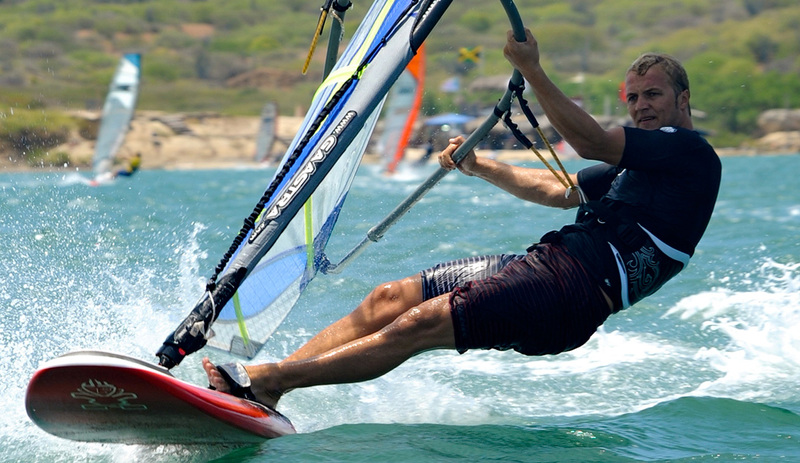 When the wind comes, it means the start of water sports season in Curacao: windsurfing, swells for surfing on the North Shore, kitesurfing and sailing. Great fun so be sure to join in. You will also see a lot of kites hanging hundreds of feet in the sky. It is a favourite local past time. Photography tip: The wind and ground swells can produce big waves on the Curacao North Shore. Visit National Park Shete Boka and drive up to Boka Pistol. The ocean water crashes on the rocky shore and creates a spectacular water show. There is a short rainy season in May/ June, which allows some plants and trees to spontaneously bloom. July will start to feel a little warmer but still nice. Summer is coming. Personally my least favourite time of year. August can still be pleasant but it slowly gets hotter and the wind starts to get more inconsistent. Then, one day, you walk outside and you notice the wind has completely dropped. The palm leaves are not moving anymore and with every little thing you do, you start sweating. It gets REALLY HOT! Make sure you have good air-conditioning in your house and car. Don’t go out into the sun for longer periods and drink enough water to avoid dehydration. Curacao will also become dry, dusty and resembles its nickname: the Rock. Curacao is located outside of the hurricane belt but the passing storms (often North of Curacao) can influence the weather in Curacao. Some cracking thunderstorms are not uncommon. Another ‘island-phenomenon’: the use of air-conditioning on the whole island goes up drastically. The power plant will often max out its capacity, which means regular power outages. Luckily they try their best to keep the power on in the bigger tourist areas. There are some advantages. No wind, means calm ocean and can provide beautiful sceneries, amazing underwater vision for snorkeling, boat trips become a lot more relaxed, paddle boarding and kayaking is incredible and it is the best time to spot dolphins. Photography tip: Time to bring out the GoPro and go snorkelling. Plus: often thunderstorms linger off the coast of Venezuela creating amazing sceneries. Hi! My spouse’s company will send him in curacao for 3 weeks for work in December 2018 and he is planning to bring me there for a week around Dec16-23. We are planning to conceive anytime for we lost our son 4 months ago. Is there a concern for Zika Virus? Are there a lot of Zica cases in your country? I am a bit concern about all this mosquito borne diseases that are happening around us. Dear Ermarie, in the tropics there are often mosquitos, especially in the rainy season. Unfortunately, mosquito borne diseases are part of the Caribbean life. But if you protect yourself, most people are fine.